Testing of the separation of the Gaia Service Module from its Launch Vehicle Adapter has been completed, as have the acceptance vibration tests on the Payload Module. 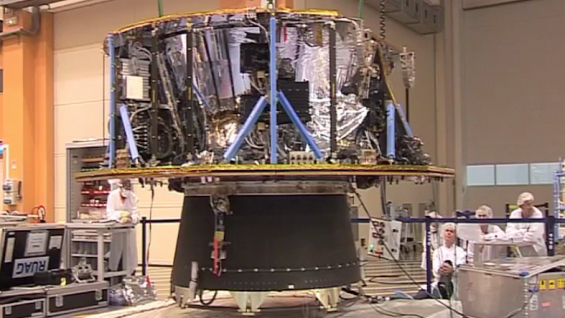 Two more important test campaigns have been completed, taking Gaia closer to launch readiness. The operation of the mechanism that will separate the spacecraft's Service Module (SVM) from the upper stage of its launcher has been verified and acceptance level vibration testing of the Payload Module (PLM) has been successfully concluded. Gaia will be connected to its Soyuz-Fregat launcher by a Launch Vehicle Adapter (LVA), a truncated conical structure manufactured primarily from carbon-fibre reinforced composite. The lower end (in launch configuration) of the LVA will be bolted to the payload interface of the Fregat upper stage. To implement a reliable separation mechanism, Gaia's launcher interface ring will be attached to the top of the LVA using a clamp band that is held closed by a pyrotechnically operated fastener. At separation, a pyrotechnic gas generator will be fired, moving a piston, which will, in turn, unlock a flywheel. With the flywheel free to rotate, the spring tension of the clamp band will pull on two coarse-pitch screw threads, which engage with female threads in the flywheel assembly. As the flywheel rotates, the threads will unscrew and the clamp band opens. The moment of inertia of the flywheel will control the rate of opening and reduce the shock induced in the spacecraft as the band opens. As the clamp band moves clear of Gaia's launcher interface ring, springs will push the spacecraft away from the upper stage of the launcher. Gaia launcher separation test. Credit: Astrium SAS. Click here for more information on this video. A test of this separation mechanism was conducted at Astrium Toulouse. The Gaia SVM was suspended from an overhead crane with the LVA attached. Instead of a pyrotechnic gas generator, compressed gas was fed to the clamp band locking mechanism via a quick-opening valve. Gravity was used to effect the separation, with the springs that will be used during launch in place but locked so that they just touched the spacecraft's interface ring. As the LVA fell away from the SVM, it landed on a cushioned protector. This test verified the correct operation of the separation mechanism and allowed the shock induced in the Gaia spacecraft by the opening of the clamp band to be measured. It also allowed checking of all the interfaces (mechanical, electrical and operational) between the Gaia spacecraft and its LVA and clamp band. Following the completion of integration of the Gaia PLM (entry #06 in this journal), the module has undergone acceptance vibration testing. Qualification level vibration testing of the protoflight PLM was performed in June 2011 (entry #01 in this journal), with many components represented by mass dummies. In order to verify the mechanical properties of the PLM and to prove that it can survive the launch, it was subjected to swept-sine and quasi-static load tests using an electrodynamic shaker. With all flight model components now installed, the PLM was tested again, at lower excitation levels, to verify the integrity of the completed system. The testing was again performed at the facilities of Intespace in Toulouse, France, under the direction of the Prime Contractor, Astrium. For acceptance testing, the PLM was subjected to swept-sinusoidal excitation along its Y and Z axes (both in the interface plane of the optical bench). The spacecraft will operate in a Lissajous orbit around the second Lagrange point of the Sun-Earth system (L2). This location in space offers a very stable thermal environment, very high observing efficiency (since the Sun, Earth and Moon are all behind the instrument FoV) and a low radiation environment. Uninterrupted mapping of the sky will take place during the operational mission phase.